Are you tired of taxiing your child all over town – to this activity and that? Do you wish your child could receive professional and energetic instruction in the comfort of your own home? Let us come to you! 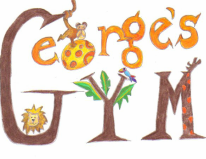 George’s Gym offers parents the chance to create their own class tailor-made to fit your schedule, lifestyle and child’s needs. You pick where, when and the length of your session. We provide instructors, equipment and a fun, unique, down-to-earth curriculum that will be sure to get your child excited about fitness and flipping! *Children must be at least 2.5 years of age to participate in this program. Payment Policy ~ All weekly Private Home Tumbling Classes must pay for at least 2 classes at a time. You can choose a different payment schedule ($60 every 3 weeks, $80 per month or more), but each parent must pay at least $40 per child every other week. If the location of your class requires us to pay for parking, we ask that you assume the cost or reserve a guest parking spot for apartment buildings. This will be worked into the cost of your class and divided among the other parents if you are in a group.